Order Ritchies Wine Sweetener 57ml from the Stirling Homebrew Shop UK. 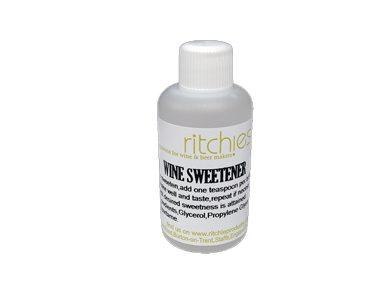 Buy Ritchies Wine Sweetener - 57ml and other Homebrew Chemicals safely online in the UK. Use wine sweetener to sweeten acidic wines. This wine sweetener doesn't keep on fermenting. Use wine sweetener to sweeten acidic wines. This wine sweetener doesn't keep on fermenting. Add one teaspoon per bottle. Shake well and taste, repeat if necessary until desired sweetness is attained. Where to buy Ritchies Wine Sweetener 57ml safely online? Shop at the Stirling Homebrew Shop if you are wondering where you can buy Ritchies Wine Sweetener - 57ml safely online in the United Kingdom. Wine Sweetener 57ml - Ritchies Wine Sweetener - 57ml in Homebrew Chemicals and Homebrew.